The Times has a week-in-review piece that provides a nice perspective on Harvard’s decision to go without an early decision program. What, then, might a world without early applications look like? It would indeed go a small way toward leveling the field among applicants, researchers say. But it would also have an effect on colleges, and the biggest winner would almost certainly be Harvard, a fact that may prevent many other colleges — perhaps all of them — from mimicking Harvard this time. Any college that does so will risk losing some of its best applicants. This is what Andy mentioned earlier this week: the decision by Havard actually become an incentive for other schools to keep their early decision programs to encourage top students from otherwise attending the most desired school in the country: Harvard. To show what the college admissions would be like without early decision, The Times cites a study by Caroline Hoxby, an economist at Harvard, of the “revealed preferences” in colleges that are demonstrated by common-admits. (I originally talked about this study back in April when discussing Cornell’s low yield rate relative to places like Columbia.) I would encourage everybody to read the paper: it’s interesting and the math will not hurt you! 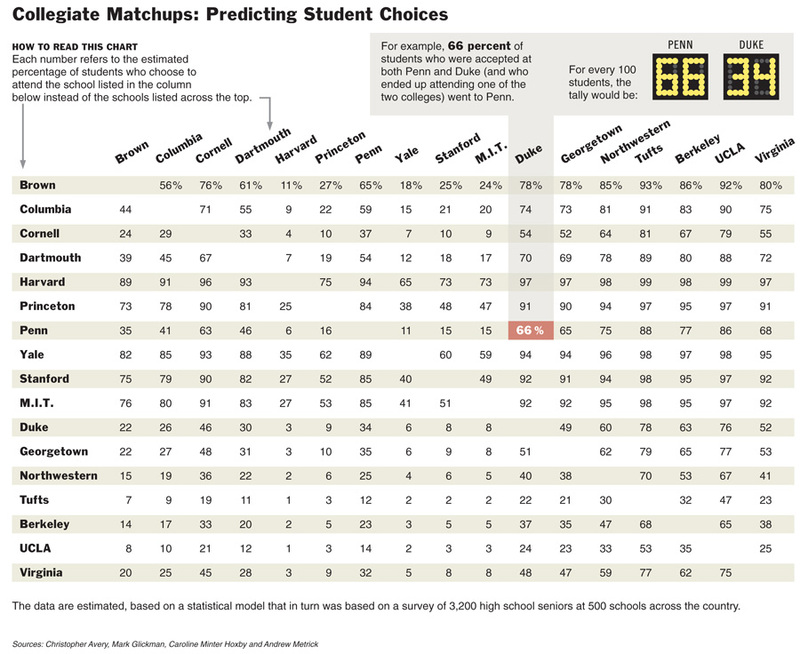 The Times even includes a handy table showing what percentage of common admits between any two colleges go where. Among common admits, Cornell wins (barely) to places like Duke, Northwestern, and Georgetown, but loses to Brown, Dartmouth and UPenn. This is why it is in the University’s best interest to keep early decision: it will gain admit some students who otherwise would have gone to Brown or Dartmouth (or Yale or Harvard) by having them apply early. Similarly, Duke or Northwestern will get some students who otherwise would have gone to Cornell had it not been for early decision programs. Now the study is not without its caveats (which I will discuss after the fold), but I wanted to point out something striking in one of the tables: Cornell loses a lot more common admits interested in either engineering or the humanities to places like Brown and Georgetown, respectively. And I think it would be a fair assessment to say that Cornell academics are a lot better than Brown for an education in the sciences and a lot better than Georgetown for an education in the humanities (even though Brown might be better than us for the humanities and Georgetown better for us in foreign relations). In fact, I knew transfers at Cornell from both schools who felt that the environment at Cornell relative to these places was wonderful. So there's something about the nature of Cornell, its academic reputation aside, that precludes students from considering it. President Rawlings obviously wanted to create a more intimate educational experience for those who wanted it, and created the West Campus residential houses as a result. But doubly-stressing the University’s wonderful teaching and research opportunities can’t hurt either. But I imagine a lot of student perceptions about schools boils down to what they hear about the place, and whether they think it is "an exciting" place to be. Are the students there doing stuff that is fun and cutting edge? Are the students there happy? Perhaps Cornell also needs to focus on these things more in order to win-out among common admits. Firstly, the data is for the graduating class of 2004, or the entering class of 2000. It's fair to assert that there probably have been some changes in the playing field over this time. Given the intensity of the data collection, the authors have no plans on updating the study for other years. There is some noise in the rankings due to small sample size and the "winner-take-all" nature of college admissions that gets magnified as you go down the list. Therefore the authors are only 65 percent certain that Cornell is actually 12th among national universities, and not 11th or 13th. Moreover, the study also gives weight necessarily to those schools that depend heavily upon binding early decision strategies (e.g. Princeton, Penn). Finally, the last issue is a rather obtuse methodological issue that touches upon several important things: The authors don't take into account those schools that an applicant didn't apply to, therefore bypassing the fact that a revealed preference is demonstrated even before an applicant gets in anywhere. This would be extremely hard to do, because it would need to factor into consideration applicant quality too, and applicant quality can't really be measured along any quantitative dimension when. The other thing that this touches upon (something that all educators would agree with) is that comparing colleges are like comparing apples and oranges. And what may be good for one student may not be good for another student. The authors try to remedy this fact by creating three separate rankings (pooled, math/scie/engineering, and humanities) but this hardly accounts for all of the dimensions that students make their collegiate decisions on (rural, urban, small, large, et. al). If you have three students (x, y, z) and two schools (A, B), and students x,y both apply and get into A, and students y and z both apply to B and both get in, then the entire ranking system is determined by where y goes. Now, I could see some application where: x could be a better student then z, and if so, then we could say that if y and x go to the same place then that place is better than where z goes. Or the opposite could be true (whereby z is better than x, and if y and z go to the same place, than that place is better). But what do you do if y is considered to be the worse student of the three according (such a situation is not at odds with the fact that y got into both schools, because x and z only applied to one school). Some of these issues grow smaller with larger sample sizes, but they still exist. Therefore, the best thing to do, in my mind, would be to discourage any ranking system.